There is no lack of ToDo apps. So many features, it takes a lot of time and money to work through all them to find one that best matches your needs. 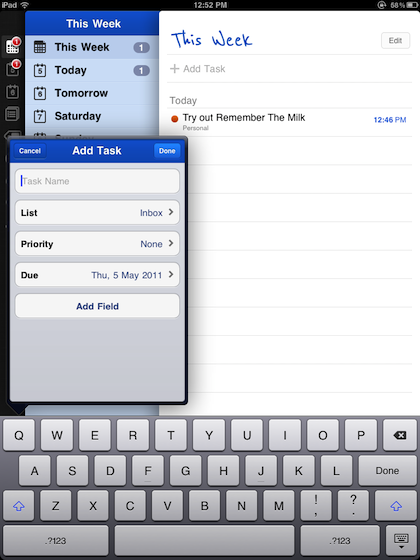 Appigo was one of the first to launch a unique iPad version amongst the Task managers. Using the larger screen, they added to their long list of features an interface reminiscent of a leather bound planner. One feature Appigo offered is syncing of the ToDos between iOS devices through either their service or Remember the Milk. While the iPhone version of the app had long used Remember the Milk online Task Manager, the company decided to cut off Appigo from offering that as an option to sync between devices. This week, Appigo announced a soon-to-be released desktop version of their ToDo app. It will sync to your multiple iOS devices through their cloud service. No idea if they will be charging for the cloud support or not. 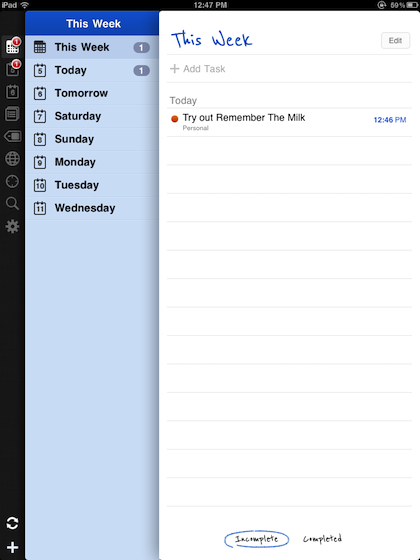 This week, Remember the Milk announced they have released their own free iPad ToDo app. 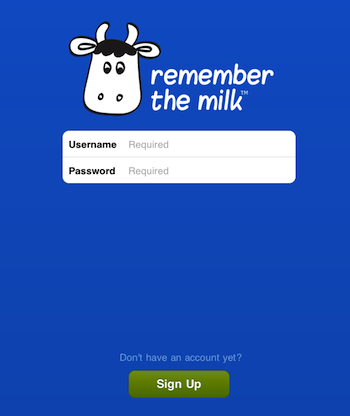 The universal app requires you sign up for the free version of Remember the Milk’s online (cloud) system. They do not have an desktop version of their app so this for syncing between iOS devices and the online version of the Task Manager. The user interface for Remember the Milk is clean with many shortcut access links to your information quickly. Nothing looks like paper or leather, the app is all about entering and managing your Tasks. One of our team members found a great use of the ‘nearby’ option for ToDos. They set up ToDo items for their daily items at the office versus when they work from home. The different lists come up to be handled depending on where they are. In the Settings area, the radius of what constitutes being ‘near’ a location is adjustable. Entering a new Task the Remember the Milk app can be done via the lower left or upper right ‘+’ buttons. You can just use the default settings and enter your Task. Or assign the ToDo item to a particular Task list, set the priority (with coloring) and set a ‘due’ date.